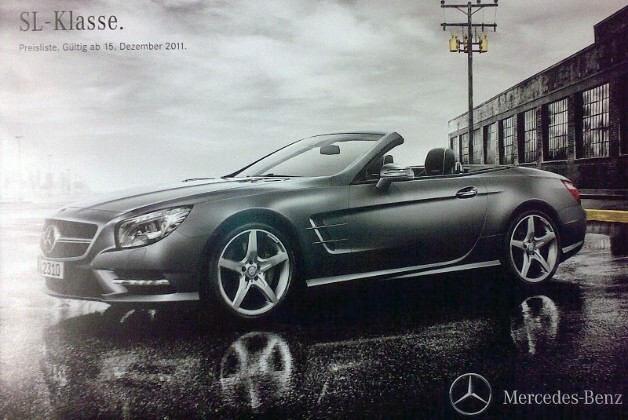 If we had to guess, we'd say these images come from a brochure of some sort, and they show the 2013 Mercedes-Benz SL from the front and rear, along with the top up and down. We also get a lone shot of the interior, and though it's all in various shades of black and white, everything looks just as polished and stately as we'd expect from M-B's range-topping non-AMG machine. We know that the 2013 SL will be a few hundred pounds lighter than its predecessor, but we don't yet know what range of engines will be in the "S-Class of Roadsters." We'd guess a few V8 options with the vestigial V12 hanging around for at least one more generation. We'll just have to wait until the 2012 Detroit Auto Show to find out all the details, but in the meantime, have a gander at the pics in our high-res image gallery.